GEM Theatrics celebrates Black History Month! Tags: "John Adams" "Abigail Adams" "My Dearest Friend" "GEM Theatrics" "slavery" "Theatre" "Theater" "Entertainment" "Black History Month" "Mary G. Kron" "Gary E. Mitchell" "Mary Beth Quillin" "
As I’m sure most of you know, February is Black History Month, and while I’m not black, I do know some history and I thought I’d share some information with you. Here at GEM Theatrics, we spend quite a bit of time delving into the early days of our country. Our newest production, “My Dearest Friend” by Mary G. Kron, focusses on the lives of John and Abigail Adams, who both had strong opinions on the issues of slavery and racial equality. We today tend to think of slavery as a southern state phenominon, and largely it was, as a result of the largely agricultural economy of the South. But, the sad truth is that for many years after the first settlers came to our shores at Jamestown and Plymouth, African slavery was a way of life in most of the thirteen colonies until the Revolution and after. And, even after slavery was abolished in some northern colonies, New England seafarers profited from the slave trade by carrying slaves to America in ships as part of the “triangle trade” (‘Molasses to Rum to Slaves’ from “1776”). In fact, Abigail Adams’ own father, the Reverend William Smith, had owned a slave, Phoebe, that had been well beloved by Abigail. Reverend Smith made provisions in his will to free Phoebe and provided her with a life-long pension. 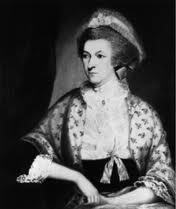 Phoebe was married in John and Abigail’s home and Abigail put her in charge of the Adams’ household when she went to France and, later, England to be with her husband in the 1780s. Despite this history of slavery, even in her own family, Abigail was convinced that slavery was wrong and that blacks deserved equal educational, if not social and political, rights. Indeed, she recounts in her letters a memorable incident with a local resident about the education of a free hired black lad working on the Adams’ farm. A telling of that story is on the first page of our website — http://www.gemtheatrics.com. It is possible that John Adams lagged behind his wife in his thinking about this issue. I’ve come to the conclusion that Abigail was often more “progressive” than John is areas of social conscience, but John, his cousin Samuel Adams, and others, recognized that the slavery issue would one day impede the country’s progress. Sam Adams wrote in the 1770s that the slavery issue would cause “trouble a hundred years hence.” John wrote that slavery would “cost the country dear.” Even Thomas Jefferson, main author of the Declaration of Independence, and a slave-holder, included language in the Declaration condemning it, but southern state delegates forced it to be removed. Slavery was, of course, officially abolished after the Civil War by the 13th Amendment to the United States Constitution. The Civil Rights Act of 1964 would officially do away with segregation and racial discrimination, but we all know that the fight for equality goes on. ps — MB and I will be at the Grand Rapids Public Library February 13 at 7p to present our signature piece, “Love Letters” by A. R. Gurney. Admission is free! AND Gary is performing with AP Theatrical in Holland in “Marriage Is Murder” by Nick Hall. This is dinner theater. The food is very good and the price is reasonable. Performances are every Friday and Saturday in February. Go to http://www.aptheatrical.com for details and to order tickets. February is a hot month for GEM Theatrics personnel! Tags: "Love Letters" "Grand Rapids Public Library" "GRPL" "GEM Theatrics" "John Adams" "Abigail Adams"
While February is usually a cold and cruel month here in West Michigan, this year is starting out as an exception. After a very warm January, February is continuing the trend, with temperatures in the 40s today. Whatever the weather, this February will be a hot month for us here at GEM Theatrics. We invite all our friends to join us February 13 at the Grand Rapids Public Library as we perform our signature piece, “Love Letters”! This performance starts at 7pm and is absolutely free! So, come celebrate Valentine’s Day with Andy and Melissa, thanks to the good people at GRPL. You’ll be glad you did! Check the rest of the website for more information about this Pulitzer Prize nominated show. Even while those preparations are going on, I’ve been busy working with my good friends at AP Theatrical to appear in their Winter production of “Marriage is Murder.” This is a very funny tale of a now divorced husband and wife murder mystery writing team, who are suddenly re-united when there’s a demand for more novels starring their detective, Miss Charlie. The couple’s separation was acrimonious and their way of writing is to try the possible ways of murdering people out on each other, so there’s a lot of hilarious tension. This show runs Fridays and Saturdays in February beginning February 10. Tickets are just $35 for dinner and the show, or $18 for the show only. That’s a great value because the food is great! Venue is the Baker Lofts in Holland. For more information, or to order tickets, go to http://www.aptheatrical.com. This year also marks the bi-centennial of the War of 1812, and that has our John and Abigail Adams noses twitching with excitement! I’ll bring you up to date on that War and the Adams’ part in it in my next blog. Stay tuned! Until then, stay warm and safe and dry and be sure to follow us on Facebook! Mary Beth and I sincerely wish that this Holiday season is filled with as much joy as your heart can stand, as much love as your heart can hold, and as much cheer as your heart can bestow. And may 2012 give to all of us a smile, a handshake, a hug, a tear or two (of joy) and good health, a warm bed and love in abundance. If we can get those things, the rest will take care of itself. Peace, my friends, and love — the mercenary stuff will resume after the Holidays!